The Malacañan Palace, led by President Rodrigo Duterte, fetes seven (7) new National Artists in an awarding ceremony held on October 24, 2018, at the Rizal Ceremonial Hall of Malacañan Palace. In attendance was National Commission for Culture and the Arts (NCCA) and Komisyon sa Wikang Filipino (KWF) chairman Virgilio S. Almario, himself also a National Artist. The newly declared National Artists are Larry Alcala for visual arts; Amelia Lapeña-Bonifacio for theatre and literature; Ryan Cayabyab for music; Kidlat Tahimik for film and broadcast arts; Francisco T. Mañosa for architecture and allied arts; Resil B. Mojares for literature; and Ramon Muzones for literature. 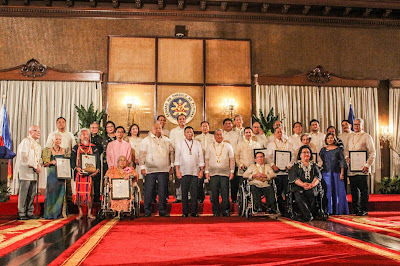 Two of them—Alcala and Muzones—were honored posthumously. Conferred by the President of the Philippines upon recommendation by the NCCA and the Cultural Center of the Philippines (CCP), the Order of National Artists or Orden ng Pambansang Alagad ng Sining is the highest recognition bestowed by the nation to Filipino artists who have made significant contributions to the development of Philippine arts and culture. 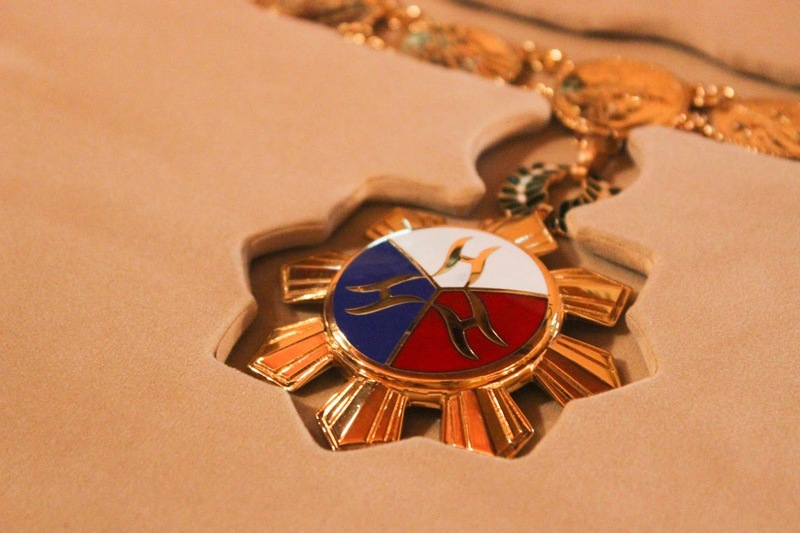 The NCCA and the CCP, which jointly administer the Order of National Artists, called for nominations on June 2017, after which the nominees and their body of works were evaluated in a rigorous process that involved panels of artists, cultural workers, scholars and experts. The year-long selection process follows a multi-layer procedure. It begins with an initial deliberation and shortlisting by a Council of Experts made up of artist peers. This is then followed by a second deliberation by the Jury of Experts who in turn submits its recommendations to the boards of the NCCA and the CCP. The NCCA and the CCP board members are joined by current National Artists to vote on the final nominees to be recommended to the President. The list is reviewed by the Office of the President’s Honors Committee before it is transmitted to the President. The President may affirm all or some of the recommended names but is not allowed to add to what has been submitted by the NCCA and the CCP. 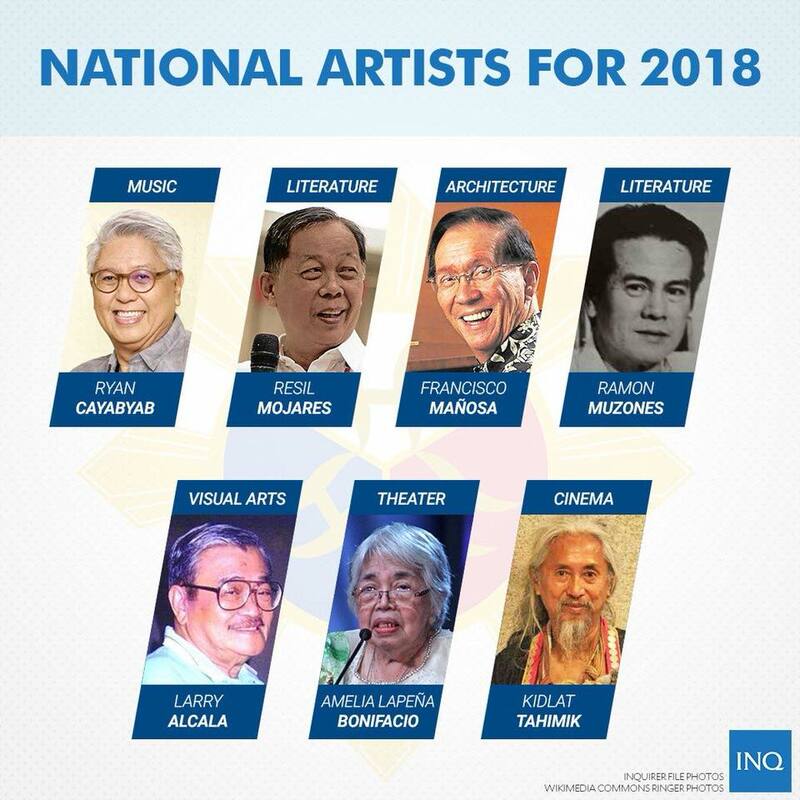 The new National Artists are icons in their respective fields and disciplines, which have grown richer with their bodies of works and the grounds they broke, and have inspired and influenced generations of artists as well as the Filipino people. In his speach, NCCA Chairman National Artist Virgilio S. Almario highlighted the diversity and excellence of this year’s awardees as a reflection of the Filipino imagination. Lauro “Larry” Alcala (18 August 1926 - 24 June 2002) is famous for his cartoons. His comic strips spiced up the slices of Filipino lives with witty illustrations executed throughout his 56 years of cartooning. He created over 500 characters and 20 comic strips in widely circulated publications. Alcala’s most iconic work, Slice of Life, not only made for decades long of widely circulated images of Filipino everyday life, it also symbolically became an experiential way for his followers to find a sense of self in the midst of an often cacophonic, raucous and at odds environment that Filipinos found themselves amidst. Amelia Lapeña-Bonifacio is known as the Grand Dame of Southeast Asian children’s theatre. She is the founder and playwright-director of the Teatrong Mulat ng Pilipinas, which has placed the Philippines on the artistic map of world theater. She has written most of the plays performed by the group based on materials culled from painstaking researches. She has also been involved in the production and design of puppets. All in all, what she has achieved is an indigenous fusion of puppetry, children’s literature, folklore and theater. Ryan Cayabyab is the most accomplished composer, arranger, and musical director in the Philippine music industry since this bloomed beginning 1970s. His learned, skillful, and versatile musical style spans a wide range of genres: from conservatory or art compositions such as concert religious music, symphonic work, art song, opera, and concerto to mainstream popular idioms in the music industry and in live contemporary multimedia shows (musical theater, dance, and film). Being very visible in the national media (once a TV host of a long-running arts and culture series and recently a judge in reality TV singing competitions), Cayabyab is a household name. His compositions reflect a perspective of music that extols the exuberance of life and human happiness, thus capturing the very essence of our Filipino soul. Kidlat Tahimik (Eric de Guia) has continually invented himself through his cinema, and so his cinema is as singular as the man. His debut film, Mababangong Bangungot (1977), was praised by critics and filmmakers from Europe, North America, Asia, and Africa and is still considered by many as a pioneering postcolonial essay film. Tahimik’s intense independence as an artist and, at the same time, the film itself called for Filipinos to actively live out their independence and not allow their culture to be imperialized by the west. Kidlat’s “imperfect” film is an exemplar of what is worldwide known as “Third Cinema,” a cinema that is critical of neocolonial exploitation and state oppression. But, unlike other Third Cinema films, Kidlat’s work does not glory in ugliness. His films, even those that lament injustice and violence, are premised on the hope of possible, though yet unrealized, triumph. His constant claim is that whatever “progress” has relegated to the realm of sadness and poverty should never remain self-referentially sad or poor. Francisco T. Mañosa, for all of his more than 60 years of architecture life, designed Filipino. From the 1960s in his landmark design of the Sulo Hotel until his retirement about 2015, he courageously and passionately created original Filipino forms, spaces with intricate and refined details. But what is most valuable is that Mañosa was in the heart and soul of a Philippine architectural movement. 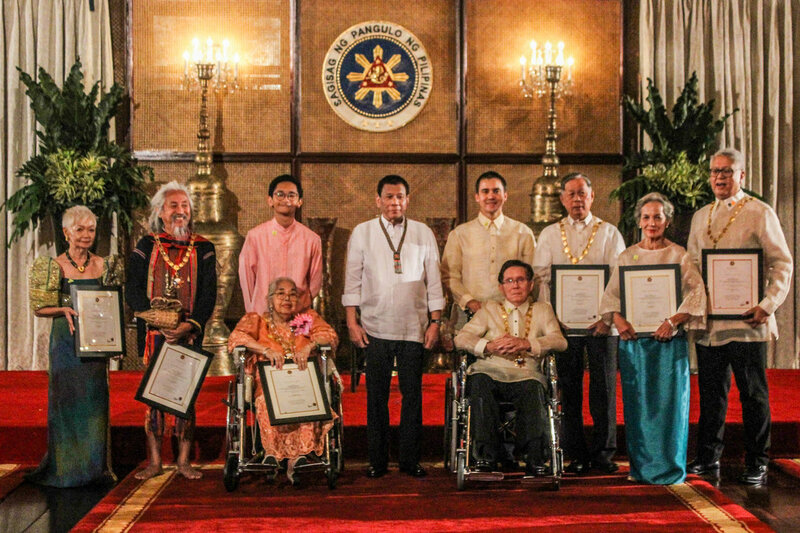 He has developed a legacy of Philippine architecture, which is essential to our Filipino identity and at the same time, deeply appreciated and shared in our world today. Resil B. Mojares is a teacher and scholar, essayist and fictionist, and cultural and literary historian. He is acknowledged as a leading figure in the promotion of regional literature and history. As founding director of the Cebuano Studies Center—an important research institution which placed Cebu in the research and documentation map—he pioneered Cebuano and national identity formation. As a leading figure in cultural and literary history, he networked actively in many organizations. For over 50 years, Mojares has published in diversed forms (fiction, essay, journalism, scholarly articles, and books) across a wide range of discipline (literature, history, biography, cultural studies, and others). To date, he has 17 published books (3 more in the press) and edited, co-edited, or co-authored 11 books, and written numerous articles for popular and scholarly publications. Ramon Muzones (20 March 1913 - 17 August 1992) was a Hiligaynon poet, essayist, short story writer, critic, grammarian, editor,lexicographer, and novelist who authored an unprecedented 61 completed novels. A number of these represent groundbreaking “firsts’ in Hiligaynon literature such as the feminist Ang Bag-ong Maria Clara, the roman a clef Maambong Nga Sapat (Magnificent Brute,1940), the comic Si Tamblot (1946), the politically satirical Si Tamblot Kandidato Man (Tamblot is Also a Candidate, 1949), the 125- installment longest serialized novel Dama de Noche (1982-84), etc. Hailed by his peers as the longest reigning (1938-1972) among “the three kings of the Hiligaynon novel,” Muzones brought about its most radical changes while ushering in modernism. With a literary career that spanned fifty-three years (1938-1990), his evolution covers the whole history of the Hiligaynon novel from its rise in the 1940s to its decline in the 1970s. Muzones tried his hand at a variety of types and proved adept in all as literary fashions. In the process, he not only extended with remarkable versatility and inventiveness the scope and style of the Hiligaynon novel, he enriched Hiligaynon literature’s dramatis personae.